Well the deal is done and the signatories have signed. It may not be the greatest deal to prevent Iran from developing the nuclear bomb. The aftermath of this deal remains to be seen. Israel and the Gulf Arab States are not happy about this deal and it is understandable. President Obama is going to great pains to reassure these concerned countries that the US will not abandon them in favor of Iran. The deal does not address the terrorism that Iran commits nor does it weaken Iran’s relations with its proxies such as Hezbollah in Lebanon or the support that Iran is giving to the Shiite Houthis in Yemen. The nuclear deal is just about preventing Iran from developing a nuclear weapon and is not concerned with Iran’s terrorist activities or Iran’s desire to destroy Israel. Obama's Iran Nuclear Deal Speech may allay some fears but PM Netanyahu’s reaction to the deal as expected was negative. 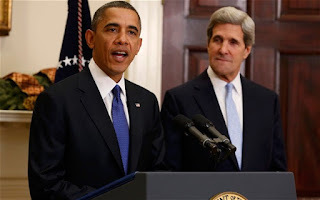 Obama did contact Netanyahu after the signing of the deal but Netanyahu is not convinced that the deal is the best thing on the market curtailing Iran’s aggressive and uncompromising attitude towards Israel, which is not part of the deal. There is room for concern and skepticism about the success of this deal in curtailing Iran’s nuclear capabilities. Iran is not a state that has much credibility neither in the West nor in the Middle East. Its human rights record is atrocious and its desire to destroy Israel remains unabated. 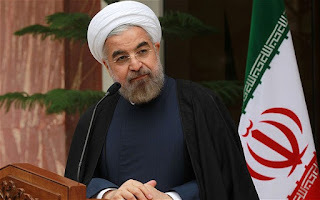 If one examines the latest Memri Clips that are on my blog, Rouhani appears conciliatory up to a point, while Ayatollah Khamanei harangues the crowds against the US, Israel and even England. One must bear in mind that the true power remains in the hands of Khamanei. The Ayatollah regime in Iran is oppressive and evil. President Rouhani of Iran remains a sugar-coated pill and a puppet of this regime that within time will disappoint all those who were captivated by his charm. On the other hand, Israel’s Netanyahu Coalition sees this as an opportunity to unite Israel under the Netanyahu banner. It comes at a time when Netanyahu is trying to unite his coalition of strange bedfellows in order to get various bills passed. The US-Iran Nuclear Deal is a fantastic digression to justify Netanyahu's maintenance of power by proving to the opposition that the danger to Israel’s existence is severe. He has managed to garner support on his stance against the deal even from the official opposition leader, Isaac Herzog. Netanyahu is making political capital over this deal as he knows that this will unite the country and strengthen his political leadership. Now that the deal is a fait accompli, Israel must move on and Netanyahu should study the agreement thoroughly. Military vigilance of course is important as Iran by its own admittance and rhetoric has no desire to recognize Israel and is even determined to destroy Israel. Obama has sent reassuring messages but time will tell whether Iran will comply with the agreement. Meanwhile, making political capital by opposing the agreement is not wise. Netanyahu will not influence Obama. We have the right to be skeptical but we have to view the deal from a wider perspective. Netanyahu is continuing with his hysterical obsession against the Iran Deal. He will not achieve anything apart from uniting the extremist masses in his government with the hope of sucking in the Zionist Camp to join his coalition. Yitzchak Herzog has denied emphatically that his party, the Zionist Camp will join the coalition. Netanyahu’s statements against the Iran Nuclear Deal do not serve Israel’s interests in the long term nor the future of Israel’s democracy. It could lead to a scenario whereby Israelis who oppose Netanyahu’s attitude to the Iran Deal will be considered traitors and be ostracized. Issues that need to be addressed are the aggressive threats against Israel and the powers who are signatories to this deal. President Obama claims that this deal is primarily to prevent Iran from developing a nuclear bomb and does not concern Iran’s aggressive rhetoric, threats and terrorism. Netanyahu’s plupperings are not going to influence the US-Iran Anti-Nuclear Deal and it would be in Israel’s best interests to remain vigilant as to the Iranian threat on Israel’s security and its existence. Israel has the right to defend itself if Iran threatens its existence. Israel’s right to defend itself should include a preemptive strike on Iran’s nuclear facilities, if there is evidence beyond any reasonable doubt that Iran has plans to destroy Israel. After Obama's Nuke Deal, What Happens If Israel Attacks Iran? Follow Shimon Zachary's board Israeli Palestinian Conflict on Pinterest. Follow Shimon Zachary's board Israel: History of its Establishment on Pinterest.